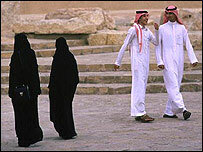 At a recent economic conference in Jeddah, unveiled women were seen talking to male delegates. There is renewed pressure for reform in Saudi Arabian society but any changes are likely to be gradual. I got off the plane, put on my black abaya and wrapped my veil around my head. It was a struggle keeping it there as I went through passport control and got my luggage. It felt strange to be shrouded in black but I instantly fit in. All the women around me are covered, some with their faces totally hidden behind a veil, others with just their eyes peering through an opening in the black cloth. I soon get accustomed to this new addition to my wardrobe. I love being able to wake up in the morning and put on just about anything; an orange T-shirt with a purple vest or a chequered shirt with a flowery cardigan. No one can see what I am wearing anyway! However, it did present some problems. We all have the habit of describing ourselves to someone we are about to meet for the first time in a public place. So every time I made an appointment, I was about to say something like: "I have short hair" or "I am wearing jeans". Obviously that was useless in Saudi Arabia, so I described my colleague as a tall man wearing western clothes. 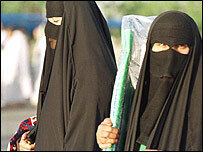 It is just as difficult to recognise a Saudi man. Both the ultra religious and the US-educated liberals are wearing white robes with red chequered or white headdresses. It is a comfortable and cool way to dress in such a warm country and it gives Saudi society something of a classless feel, everybody looks the same. But this is not an egalitarian society. When I first arrived at the hotel, I was determined to implement my New Year's resolution to get fit so I looked for the hotel gym. But it was only for men. Segregation here is everywhere. You have got women-only lifts, women-only bank sections and restaurants with men-only and so-called family sections, where women can go alone or with male relatives. 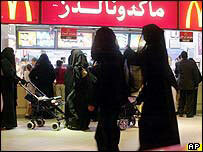 In the relatively liberal city of Jeddah, the family section looks like any other restaurant area. But in the much more conservative Riyadh, the family section is a collection of booths and diners hiding behind sliding doors or curtains. It was a surreal experience and a nightmare trying to attract the waiter's attention. Saudi Arabia is a country of contradictions. The towns look like American suburbs with five-lane streets and malls everywhere, but with a mosque on every block. 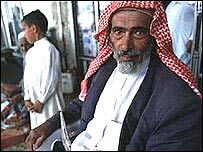 It is an Arab country but even Saudis need English to get by because shop attendants and taxi drivers are all foreigners, usually English speaking Asians. They are here to do the work Saudis find too menial. In the shops you find women covered in black from head to toe, shopping for revealing dresses and racy underwear they will wear in private. My favourite contradiction was in Jeddah. This is a country with no cinemas and no music in the shops, a country where public concerts are few and far between. Its handful of museums are mostly open only by appointment out of fear that hardliners might come in and destroy ancient statues as, in Islam, human representation is forbidden. Yet Jeddah itself is a huge modern art museum. Every roundabout features a funky sculpture or art installation. One monument is made out of the parts of the country's first desalination plant. Another shows models of the Saudi navy fleet. But the seaside promenade is a real gift to the eye. From Joan Miro to Henry Moore, the work of the world's best artists can be seen here. Of course, this being Saudi Arabia, all the sculptures are abstract. Religion permeates all aspects of life. I went to one of Riyadh's many shopping malls where you can find western franchises like Marks and Spencer and Harvey Nichols. Shops close from midday prayer until 1600 so I aimed for 1630. I had barely arrived when I was asked to leave as it was now time for sunset prayers. Half an hour later I was shopping again, but within half an hour, it was time for dinner-time prayers, and again the shops closed. After 10 days in Saudi Arabia, I had finally mastered a technique to keep the veil on my head. But it was time to leave. I remembered a story a Lebanese friend living in Saudi Arabia told me to illustrate the schizophrenic character of this society. Flying back to Lebanon, he would sometimes be seated alongside a woman, dressed all in black, her face covered. He would doze off during the flight and wake up to find himself, not next to this black shape, but to a young woman, with dyed blond hair, glossy red lips and abundant cleavage. When I woke up as we landed in Beirut, I looked around me. I did not see any Pamela Anderson-like transformations, but I for one was back to my old appearance and my western wardrobe. My black cloak was no longer an excuse to ignore fashion. From Our Own Correspondent was broadcast on Thursday, 12 February, 2004 at 1100 GMT on BBC Radio 4. Please check the programme schedules for World Service transmission times. Are Islam and modernity compatible?